Commemorating URDI’s 20th anniversary, Urban and Regional Development Institute and Sugijanto Soegijoko Foundation have expressed the idea related to the concept and approach in handling urban problem in Indonesia, by publishing the book of Bunga Rampai “Indonesian City Development: From Planning to the Implementation of Urban Development in Indonesia”. The fourth book of the series published years before, contains all thoughts from practitioners and urban expertise which discussed the concept and experience of urban development actors in policy formulation in the national level, local level, and some efforts outside the government. This book discussed five main themes, there are : 1) urban development, 2) urban housing for low income community, 3) environment and climate change related to the disaster, 4) land and spatial planning, and 5) good governance. Those five main themes were discussed from the concept to the implementation. 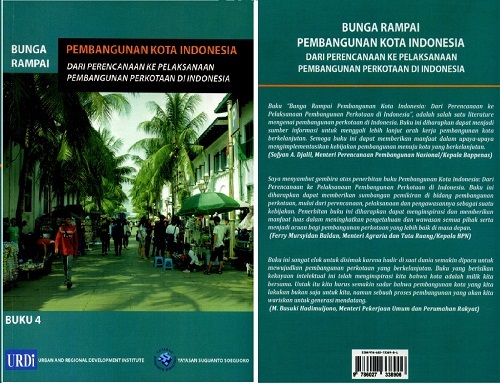 This book was written for urban actors, academicians, and students who want to have more understanding on urban issues in Indonesia through concept exposure and practices in handling urban issues in Indonesia. The Urban and Regional Development Institute (URDI) is an independent not-for-profit research organization establised in 1995. URDI’s vision is to promote a sustainable urban dan regional development in social, economy, and environment aspects in Indonesia.